This book is primarily for a first one-semester course on CFD; in mechanical, chemical, and aeronautical engineering. Almost all the existing books on CFD assume knowledge of mathematics in general and differential calculus as well as numerical methods in particular; thus, limiting the readership mostly to the postgraduate curriculum. In this book, an attempt is made to simplify the subject even for readers who have little or no experience in CFD, and without prior knowledge of fluid-dynamics, heattransfer and numerical-methods. The major emphasis is on simplification of the mathematics involved by presenting physical-law (instead of the traditional differential equations) based algebraic-formulations, discussions, and solution-methodology. The physical law based simplified CFD approach (proposed in this book for the first time) keeps the level of mathematics to school education, and also allows the reader to intuitively get started with the computer-programming. Another distinguishing feature of the present book is to effectively link the theory with the computer-program (code). This is done with more pictorial as well as detailed explanation of the numerical methodology. Furthermore, the present book is structured for a module-by-module code-development of the two-dimensional numerical formulation; the codes are given for 2D heat conduction, advection and convection. The present subject involves learning to develop and effectively use a product - a CFD software. The details for the CFD development presented here is the main part of a CFD software. Furthermore, CFD application and analysis are presented by carefully designed example as well as exercise problems; not only limited to fluid dynamics but also includes heat transfer. The reader is trained for a job as CFD developer as well as CFD application engineer; and can also lead to start-ups on the development of "apps" (customized CFD software) for various engineering applications. "Atul has championed the finite volume method which is now the industry standard. He knows the conventional method of discretizing differential equations but has never been satisfied with it. As a result, he has developed a principle that physical laws that characterize the differential equations should be reflected at every stage of discretization and every stage of approximation. 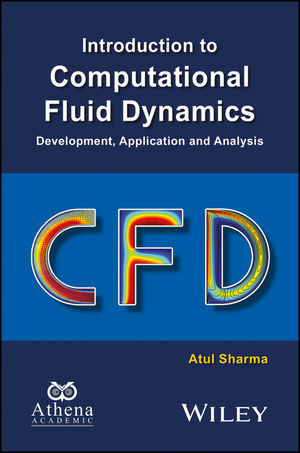 This new CFD book is comprehensive and has a stamp of originality of the author. It will bring students closer to the subject and enable them to contribute to it." Dr. Sharma is an Assistant Professor in the Department of Mechanical Engineering at the Indian Institute of Technology, Bombay. His main research interests include computational fluid dynamics, simulation of moving boundary problems, and simulation of convective heat transfer for external and internal flows. He currently teaches courses on Fluid Mechanics, Heat Transfer, Fluid Dynamics, Computational Methods in Thermal and Fluid Engineering, and Computational Fluid Dynamics and Heat Transfer.